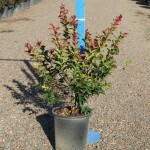 A large upright shrub or small tree with cherry red flowers held on 20" panicles from July thru September. New leaves are crimson, quickly changing to dark green. The fall color is orange. 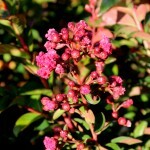 It prefers full sun and most well-drained soils. Drought tolerant and highly resistant to mildew. Use as a specimen or in mass plantings. PP 11,342.